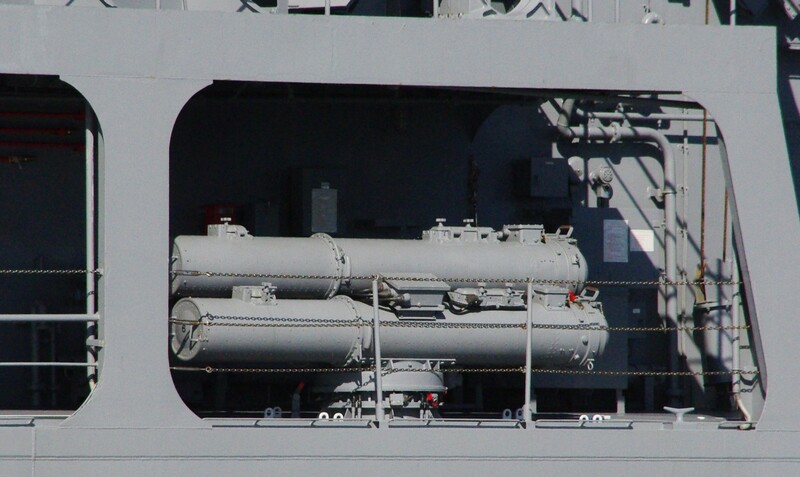 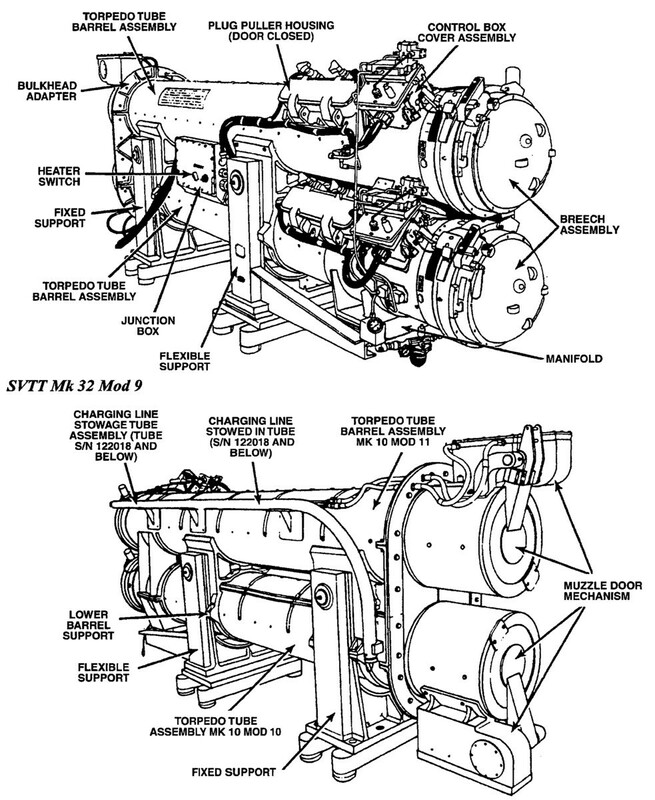 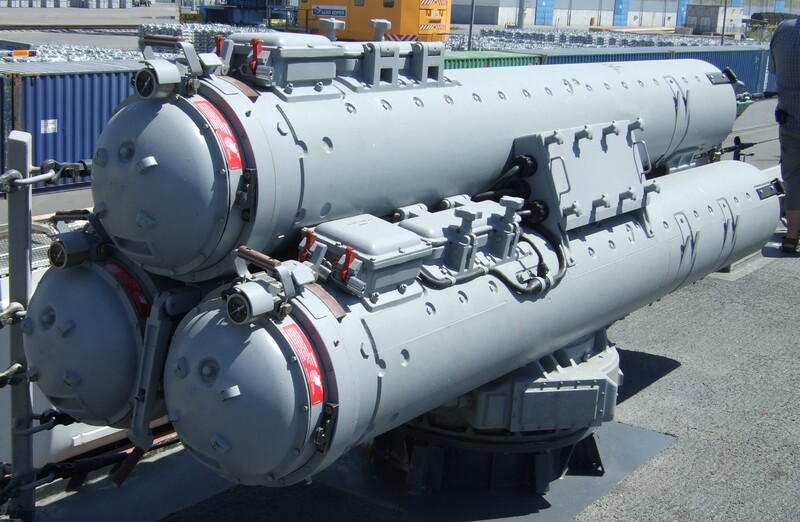 as Type-68 (Model HOS-301, HOS-302A, HOS-303) torpedo tubes. 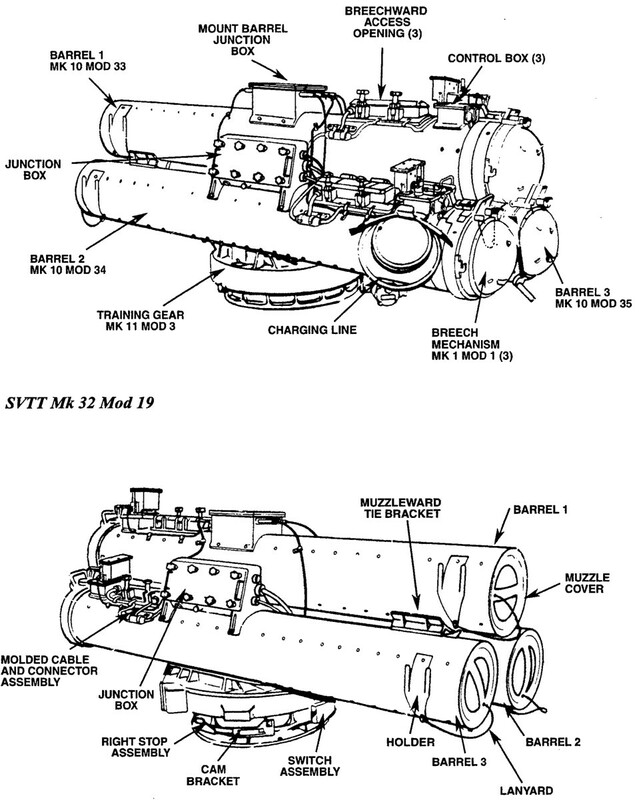 SVTT Mk 32 Mod. 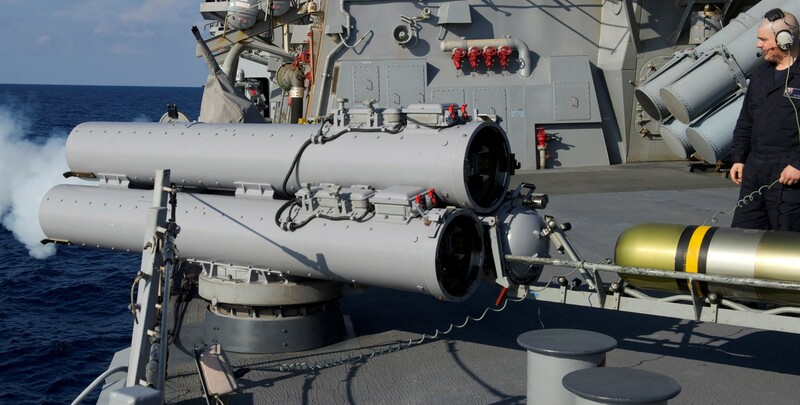 5 and 7 are designed to launch Torpedoes Mk-44 and Mk-46 from the weatherdecks of surface vessels. 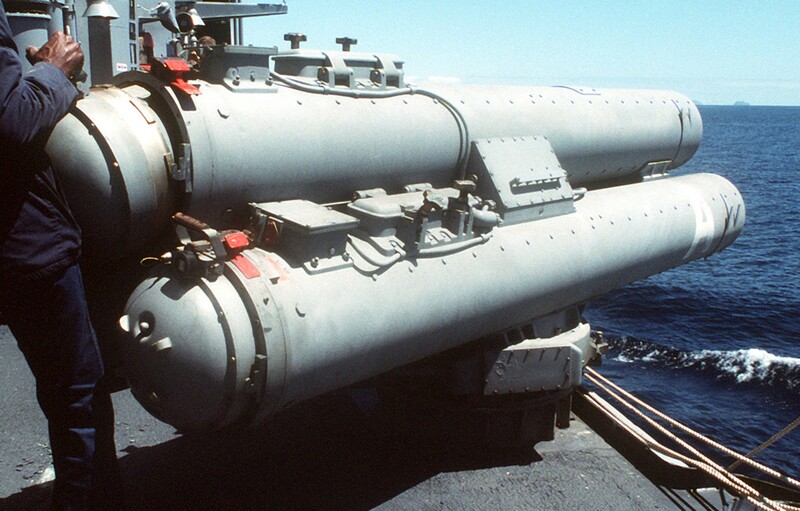 The Torpedoes are pneumatically launched and may be fired locally (at the tube) or from a remote location. 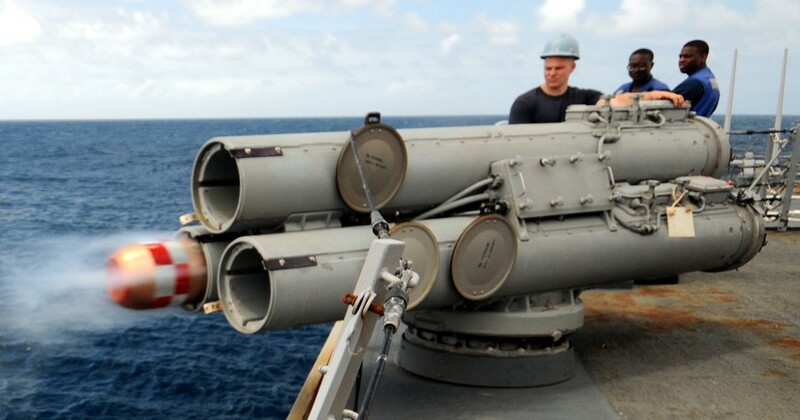 Physically, Mods. 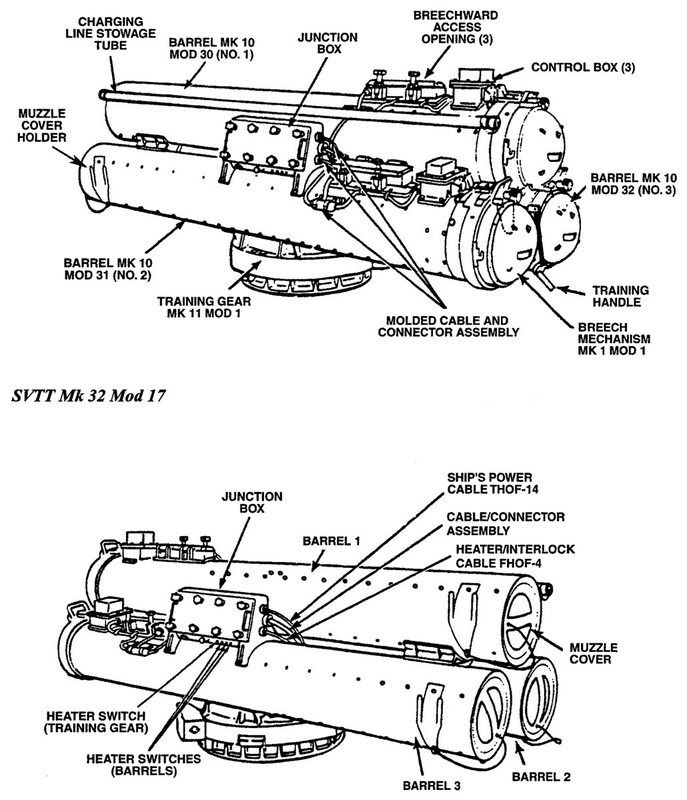 5 and 7 are identical - except for electrical circuitry required to satisfy different fire control systems. 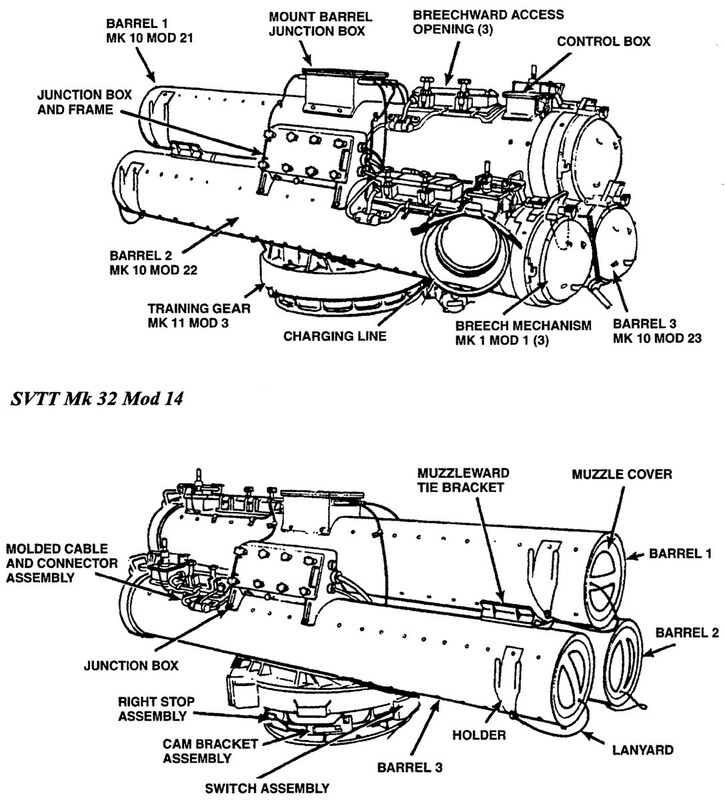 SVTT Mk 32 Mod. 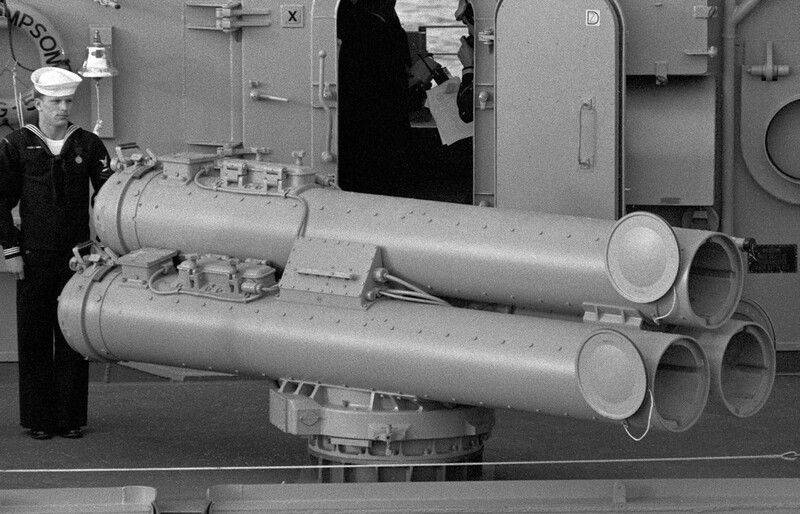 9 is a two-barrel torpedo launcher designed for stationary port and starboard deckhouse installation to launch Mk-44 & Mk-46 torpedoes. 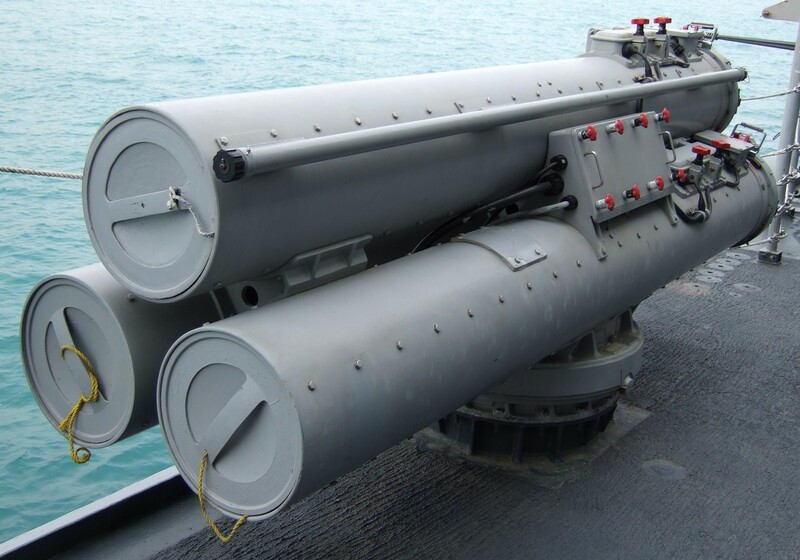 SVTT Mk 32 Mod. 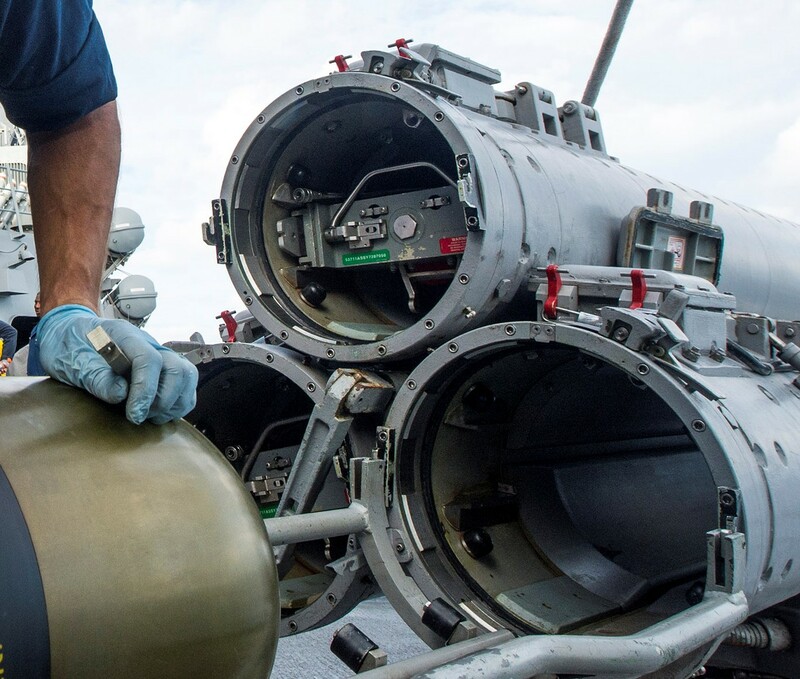 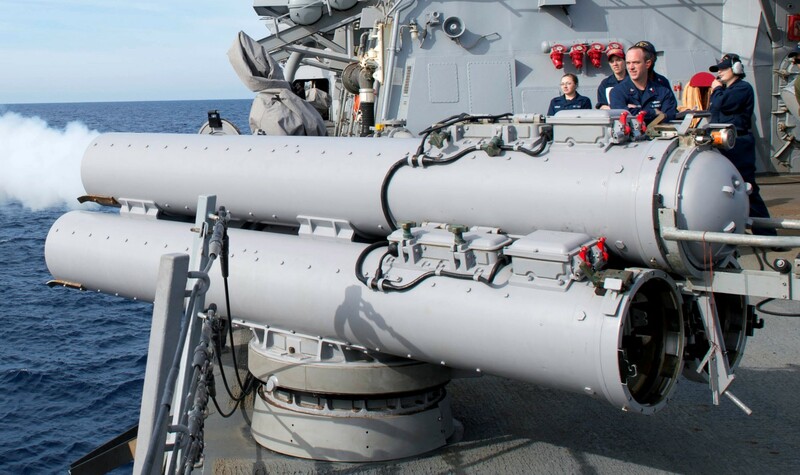 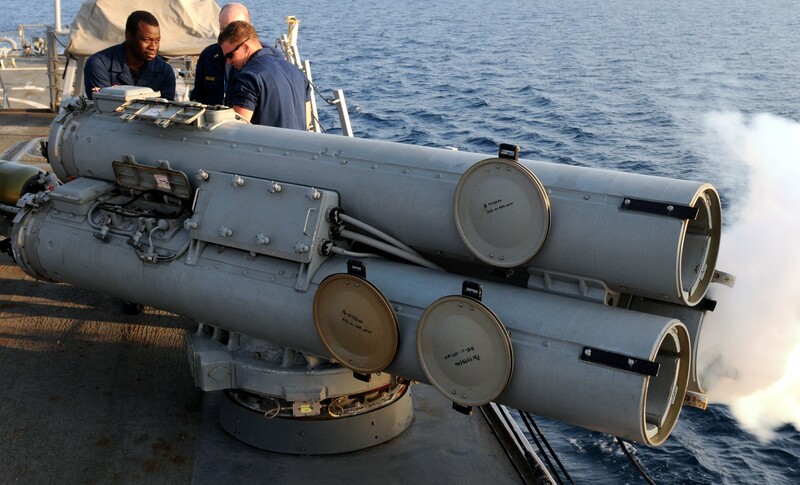 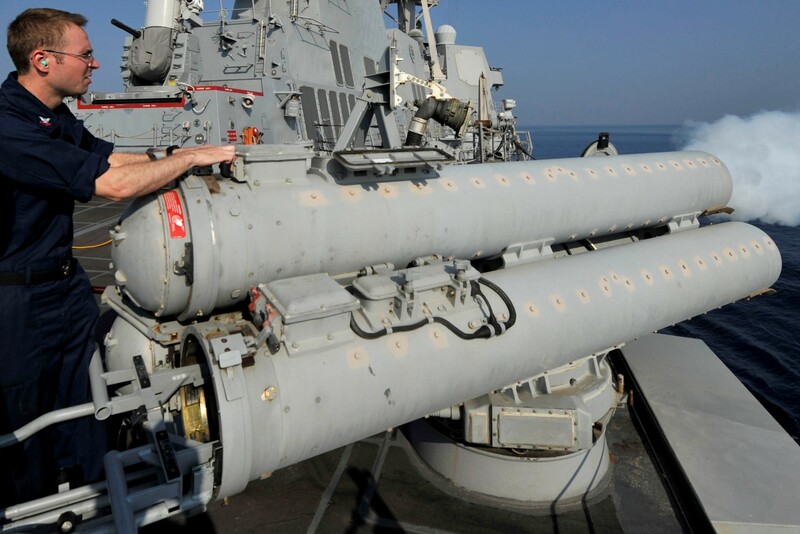 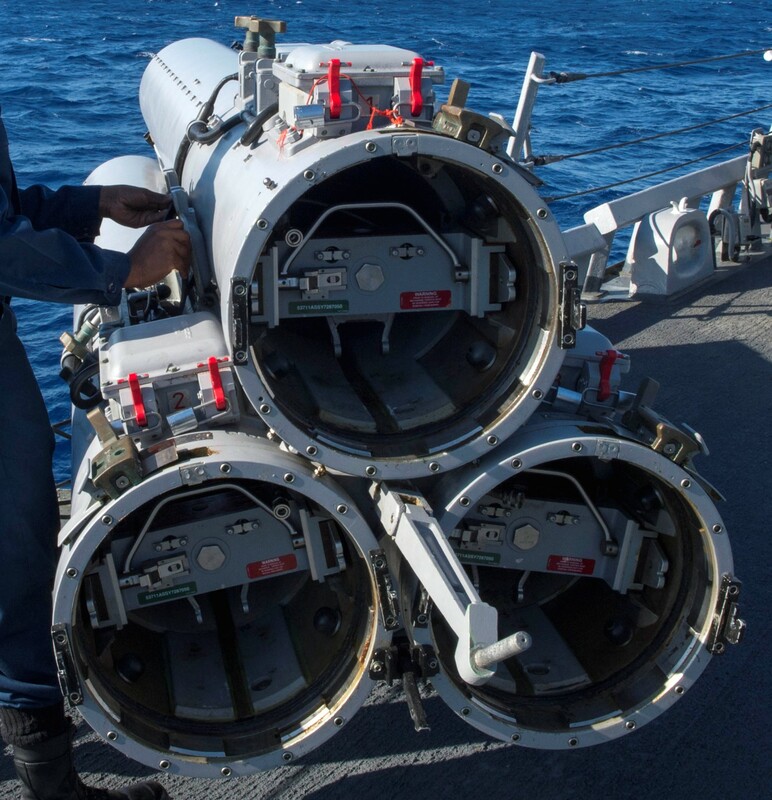 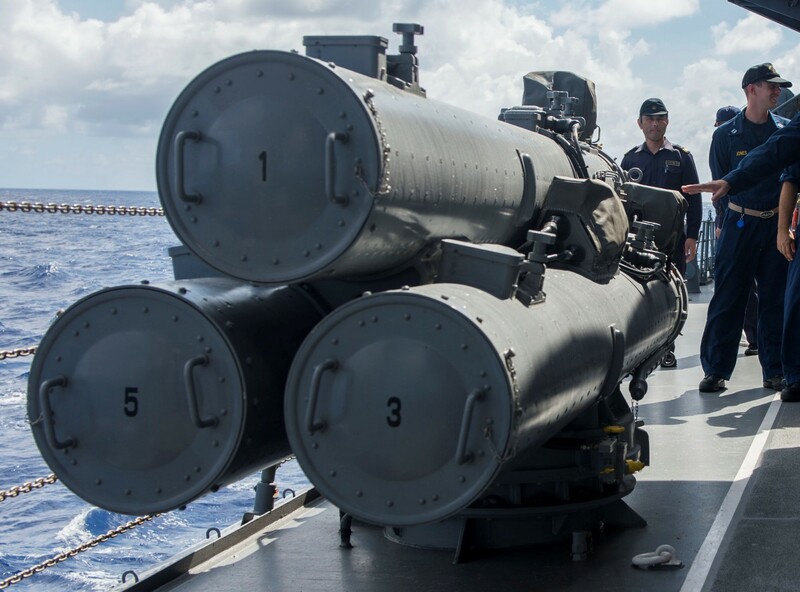 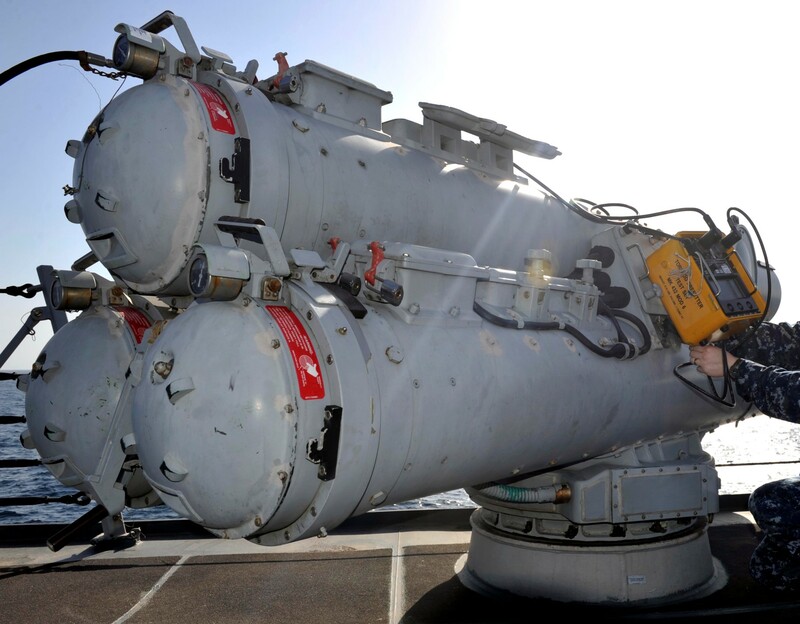 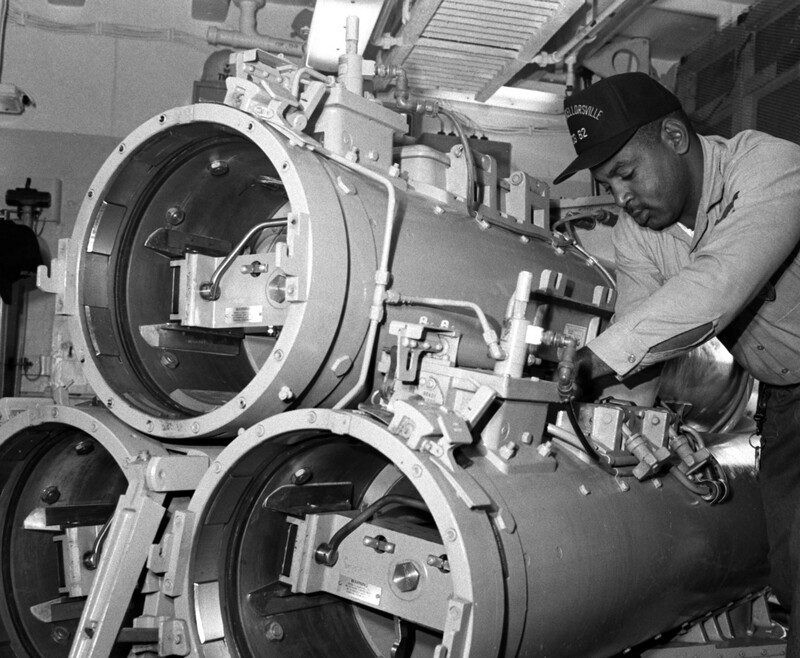 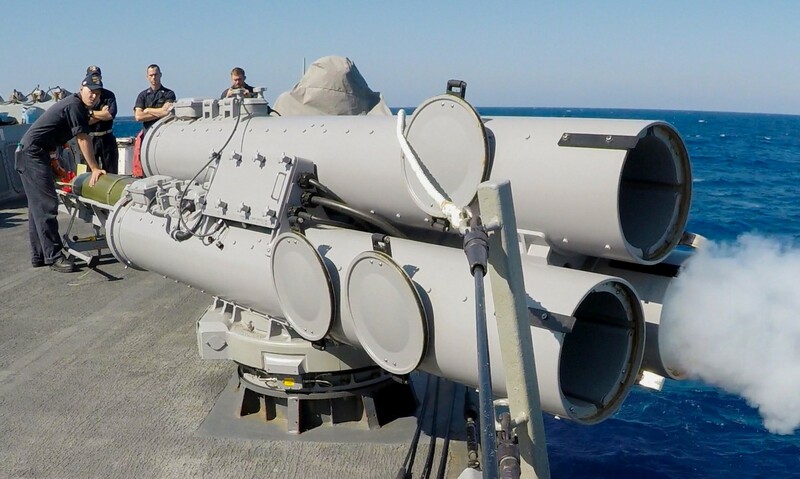 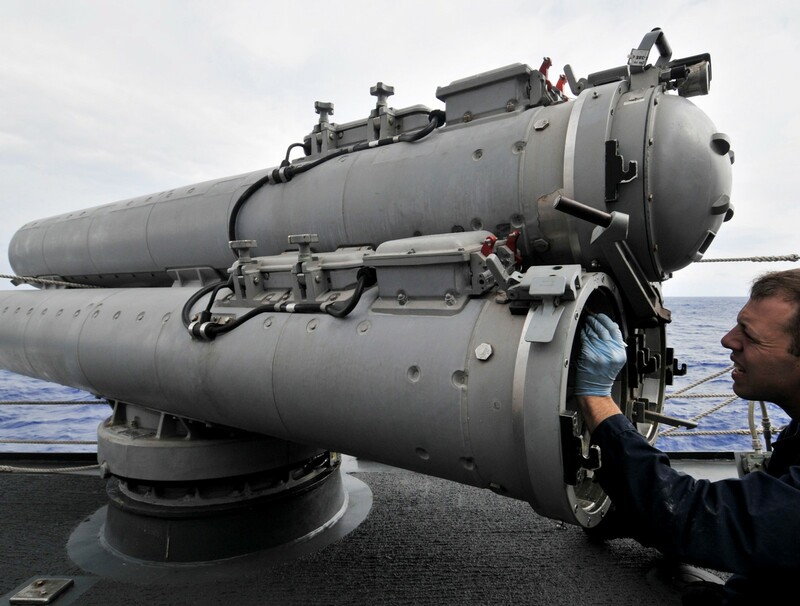 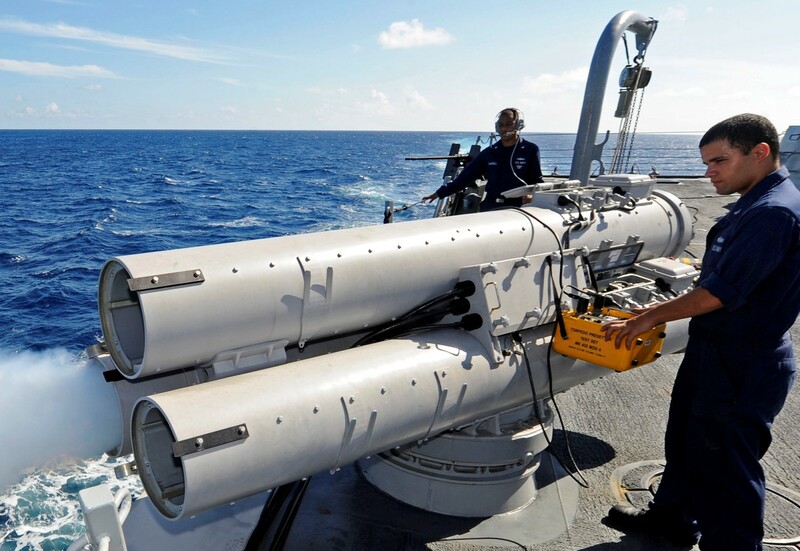 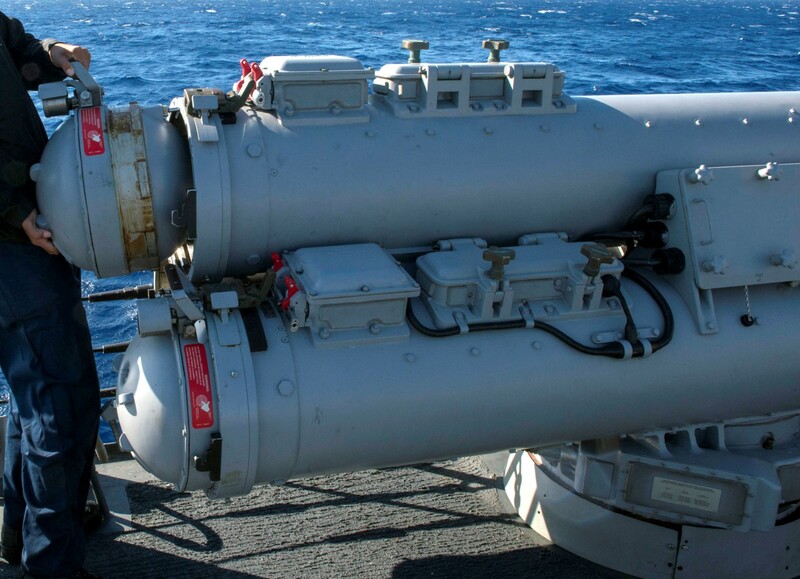 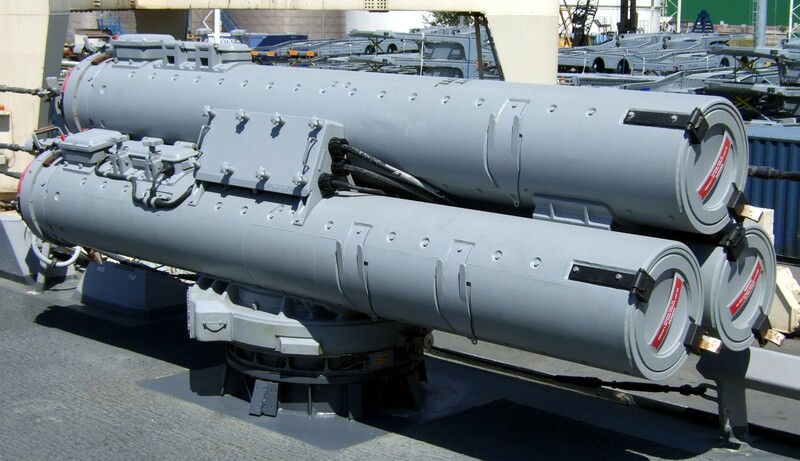 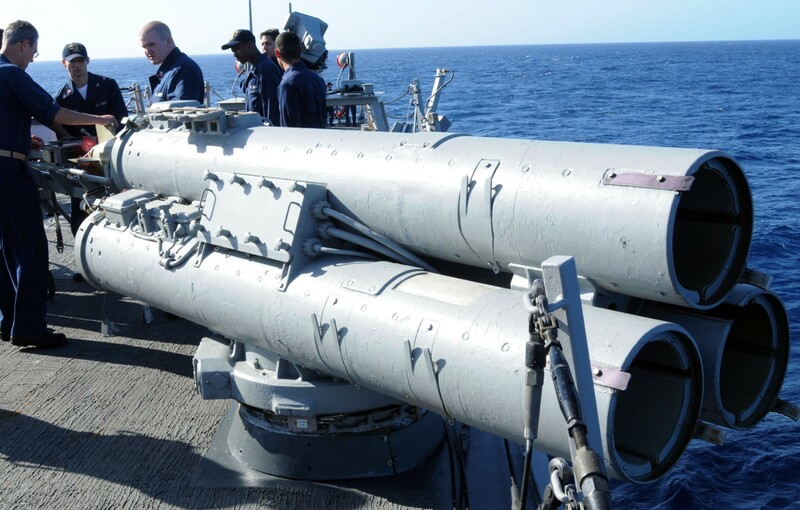 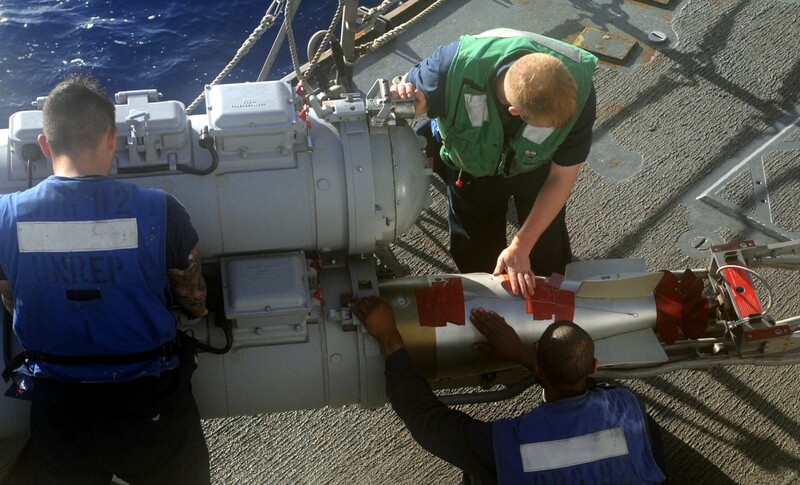 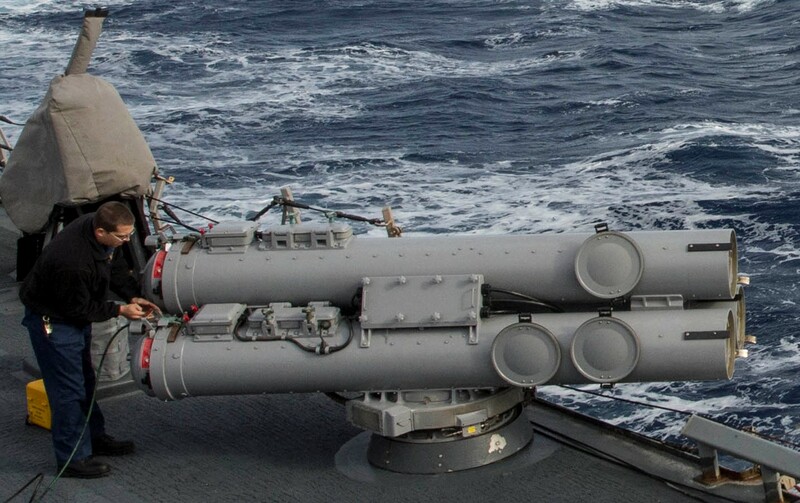 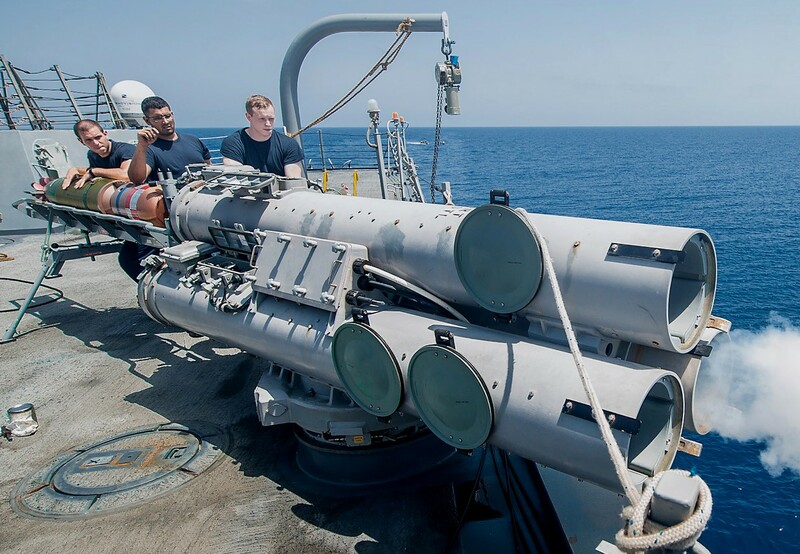 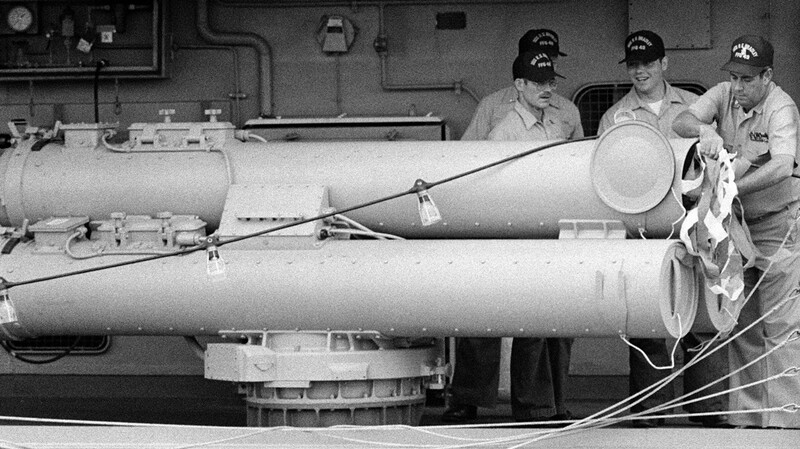 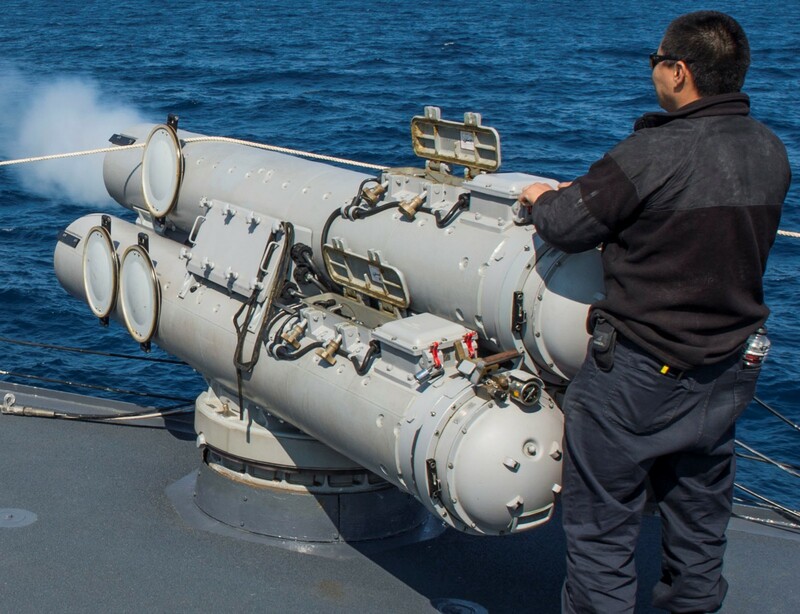 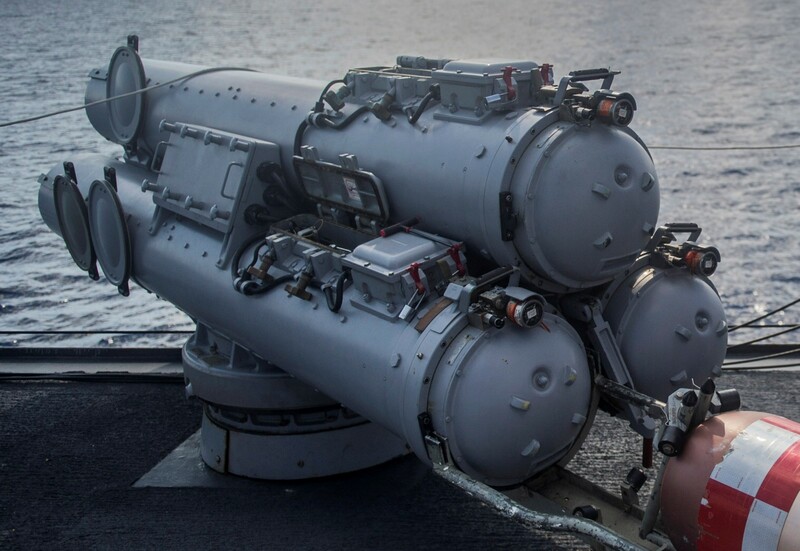 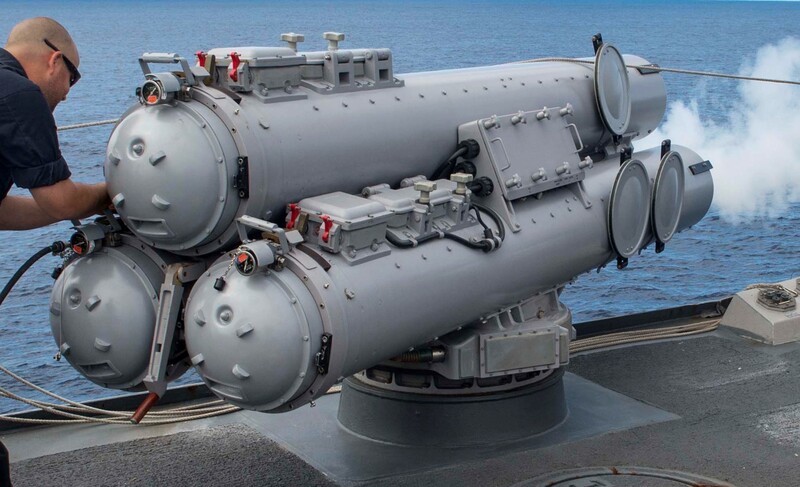 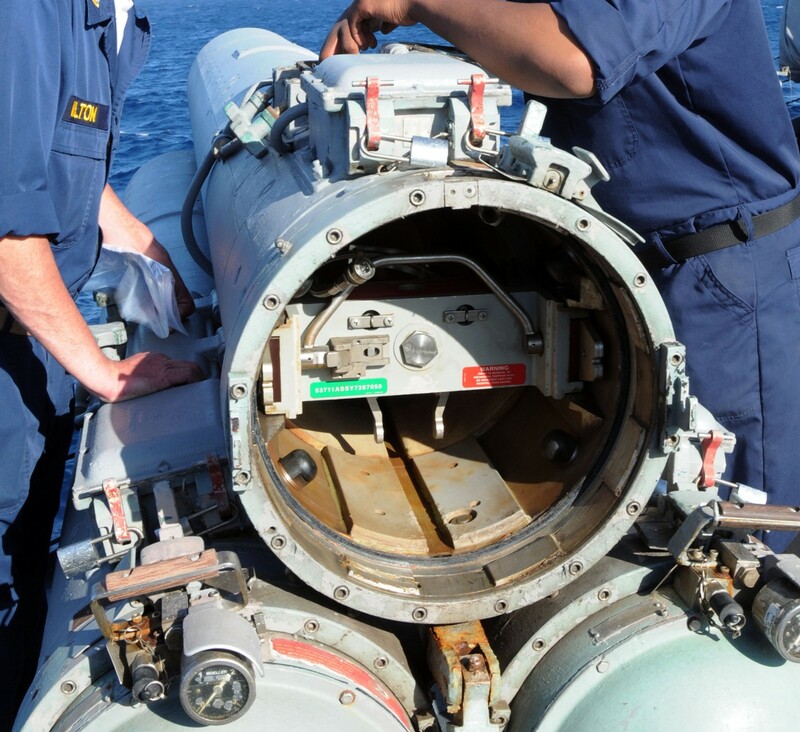 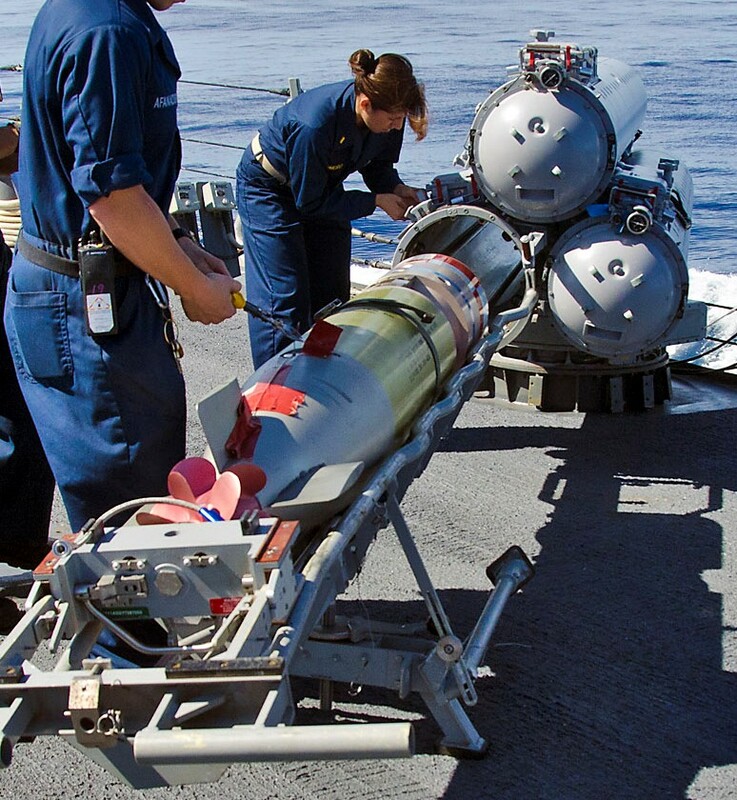 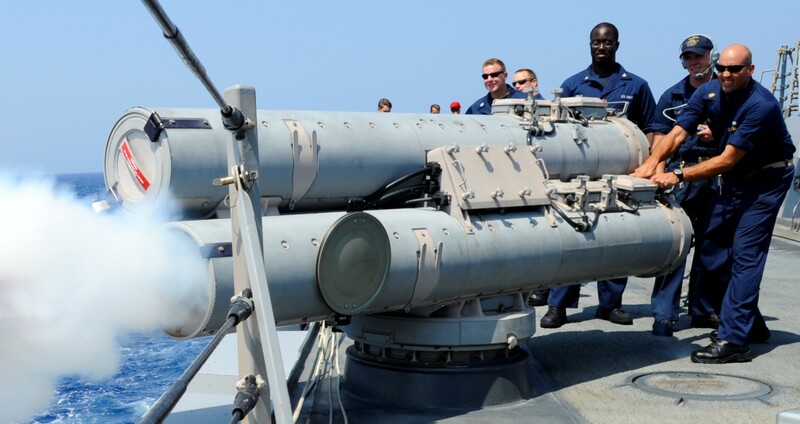 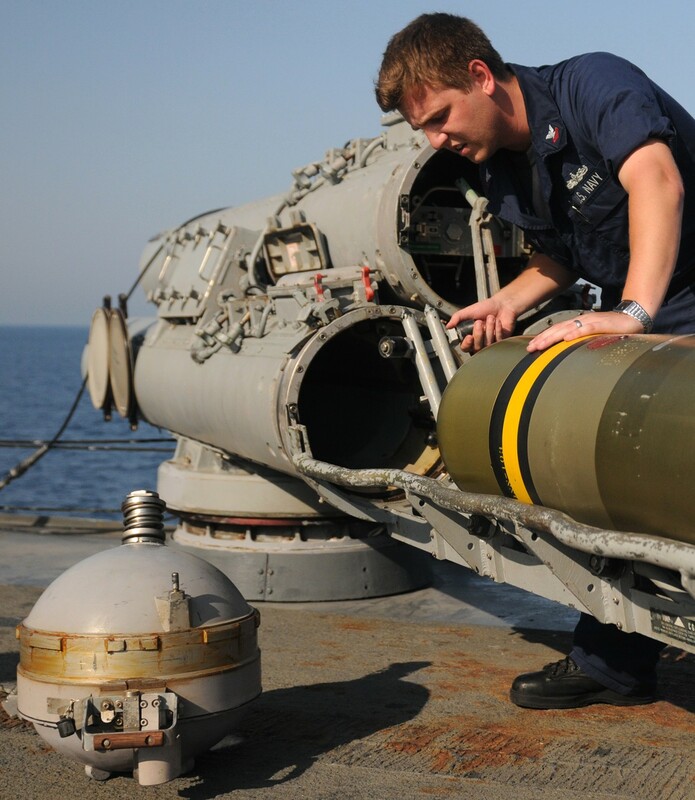 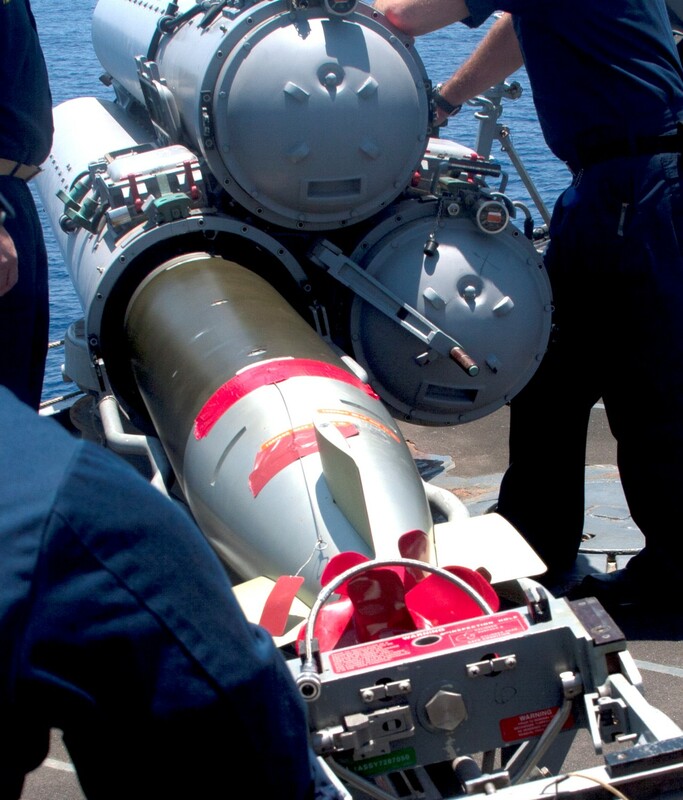 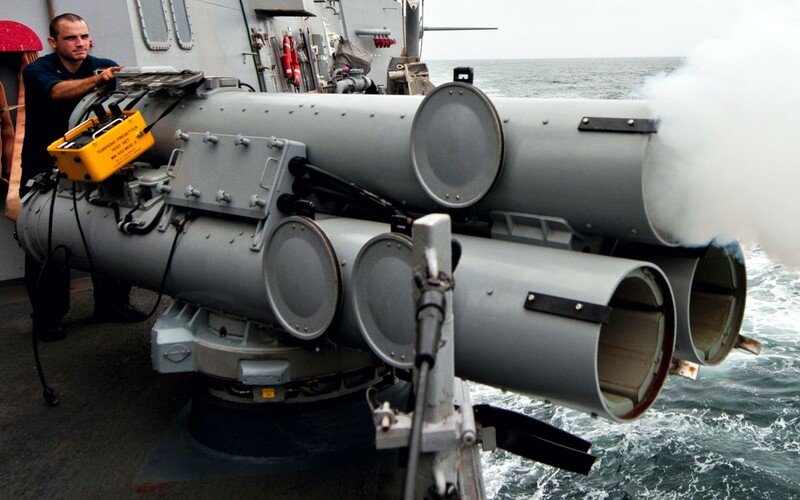 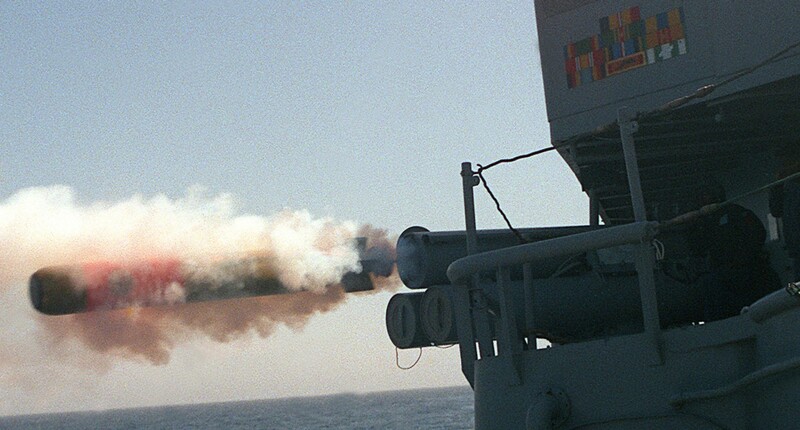 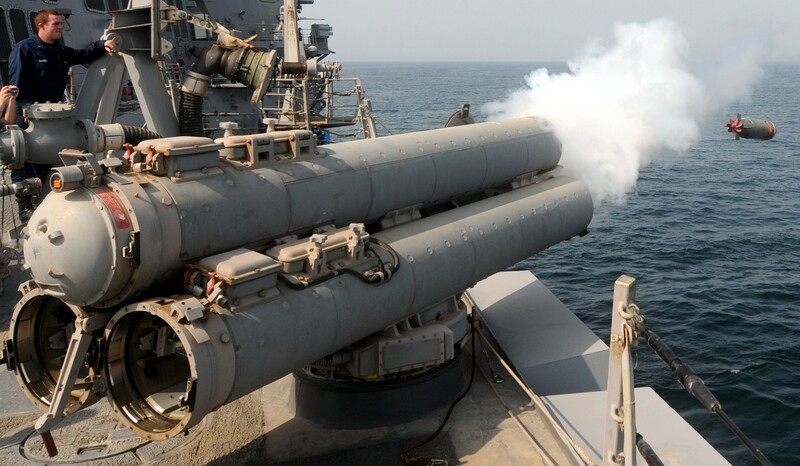 11 is a single-barrel configuration mounted at a fixed angle on rigid supports to launch Mk-44 & Mk-46 torpedoes. 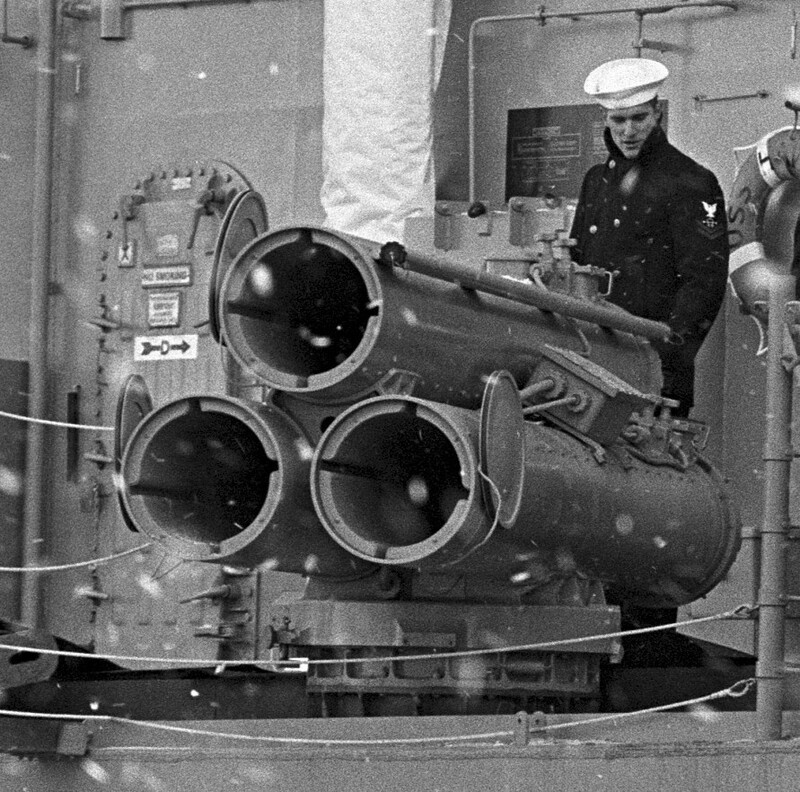 The Mod. 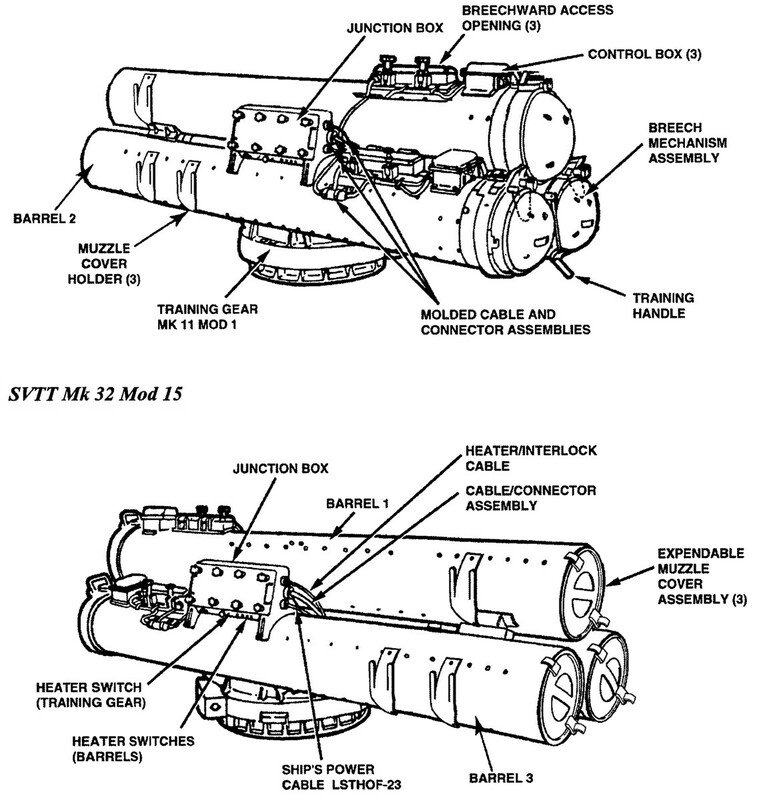 11 has a safe/ready remote capability. 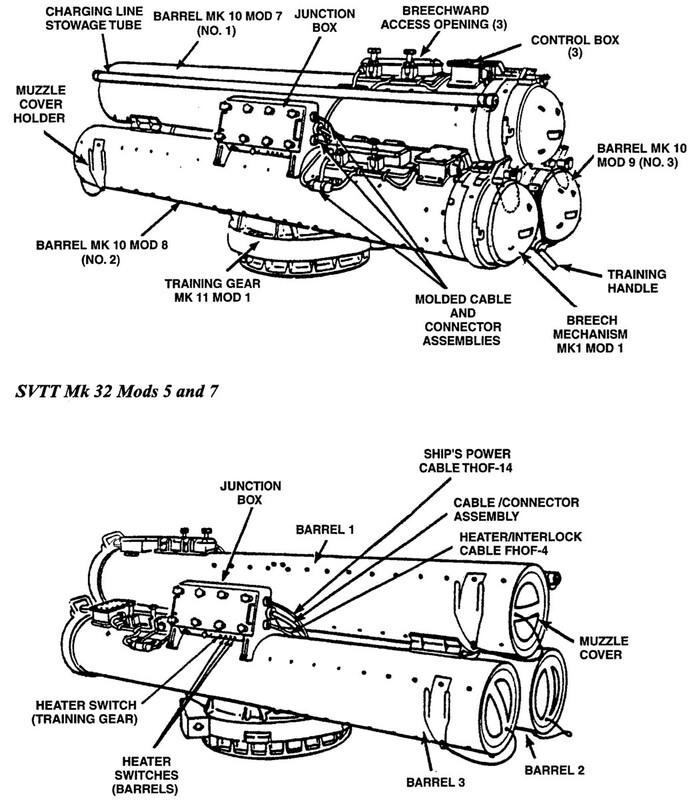 SVTT Mk 32 Mod. 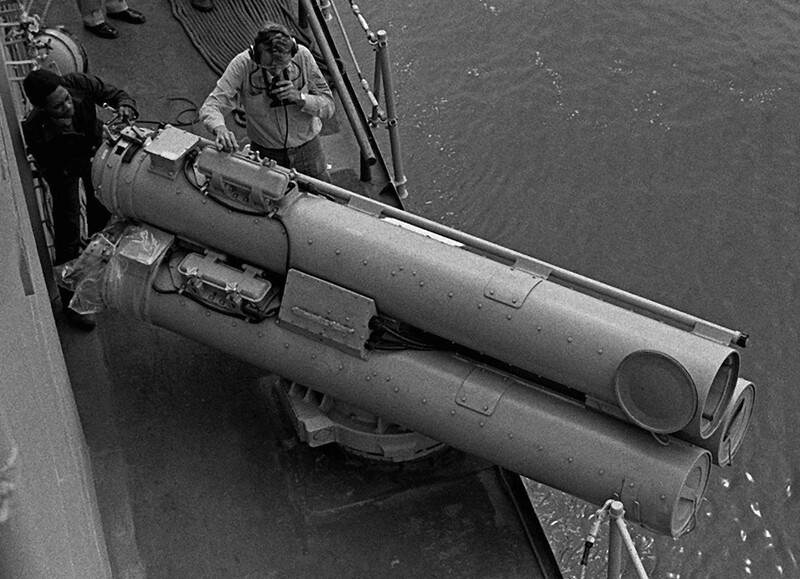 14 is a deckhouse-installed tube capable of launching Mk-44 and Mk-46 torpedoes. 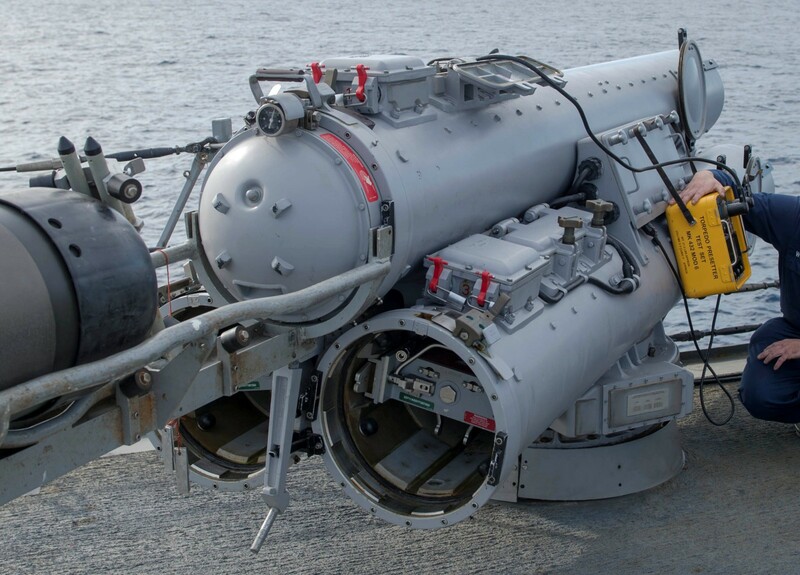 The Bulkhead Mounted Control Box (BMCB) Mk-60 and Operability Cable, although functionally related to the tube, are located off-mount. 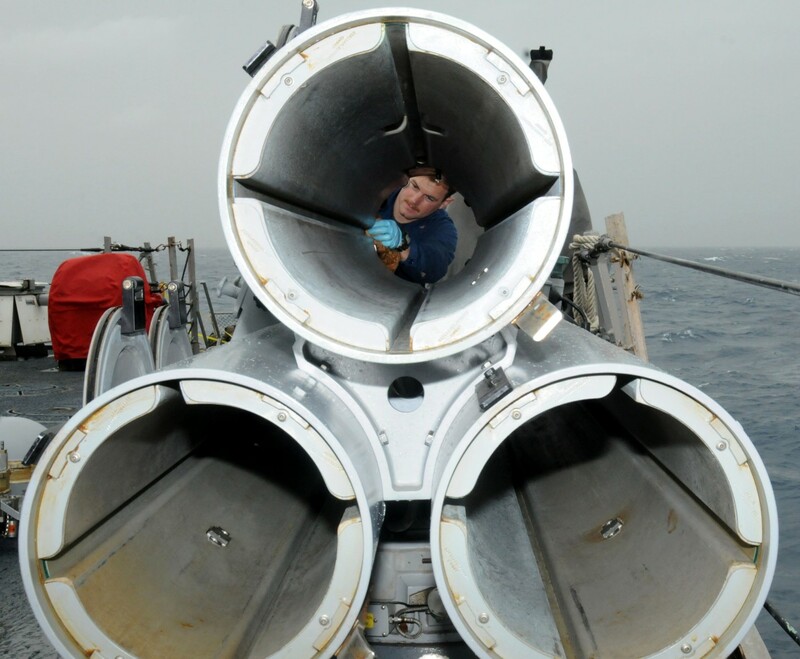 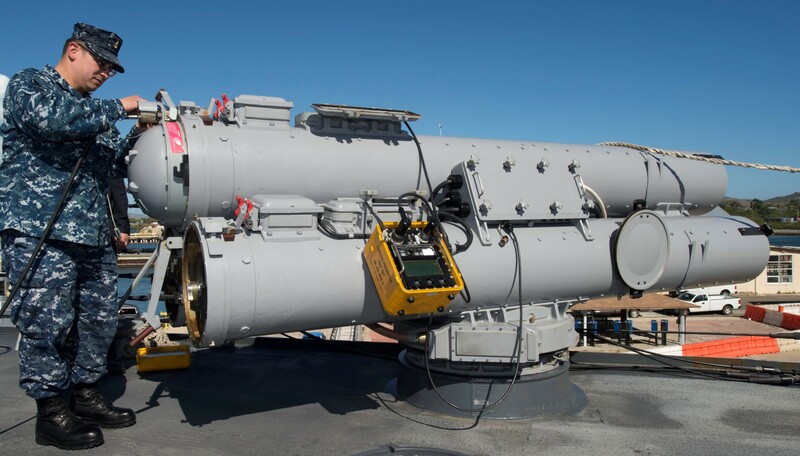 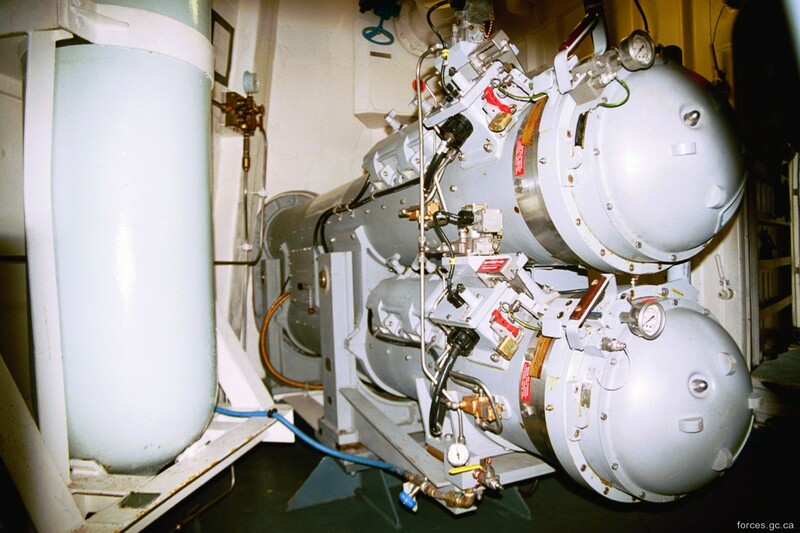 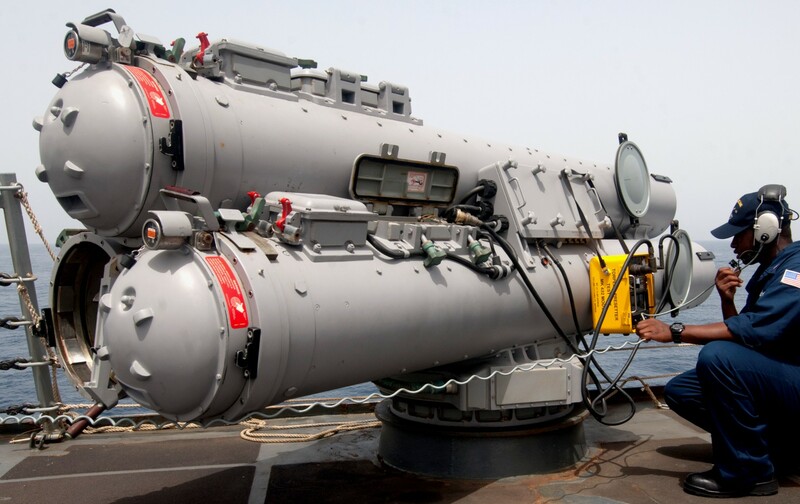 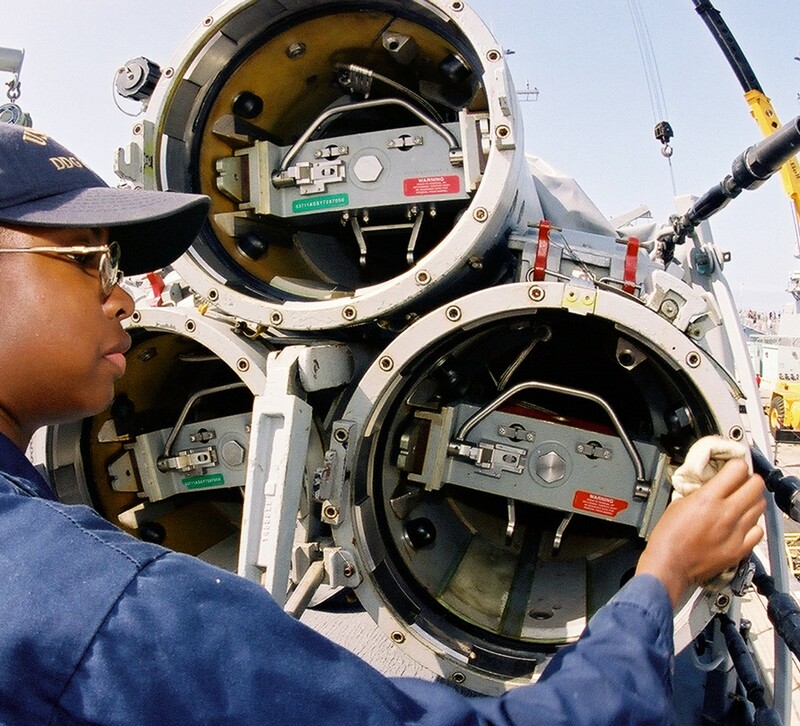 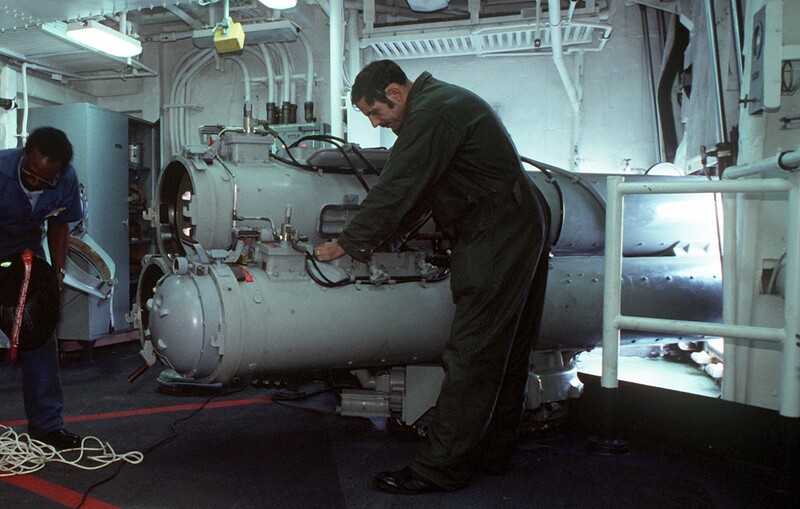 The BMCB provides the capability of selecting either remote or local operation of the torpedo tube training gear and torpedo room firing door. 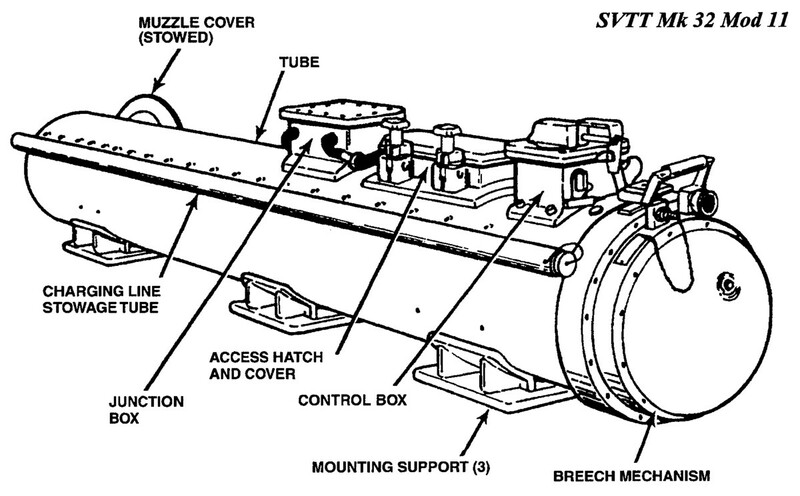 Control and test functions are also routed through the BMCB. 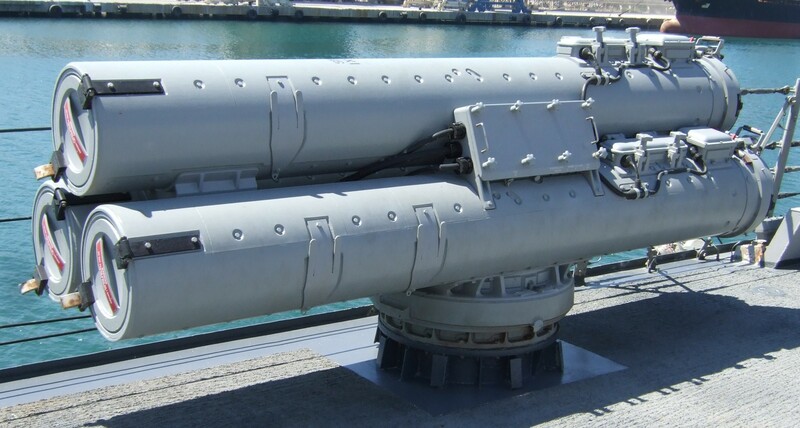 SVTT Mk 32 Mod. 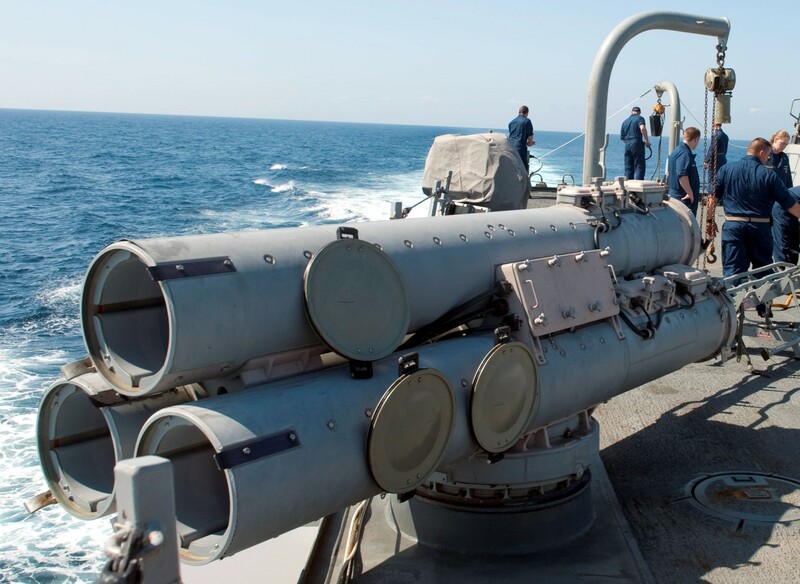 15 is a weatherdeck-installed launcher capable of launching Mk-46, Mk-50 and Mk-54 that is fully operational without local manning. 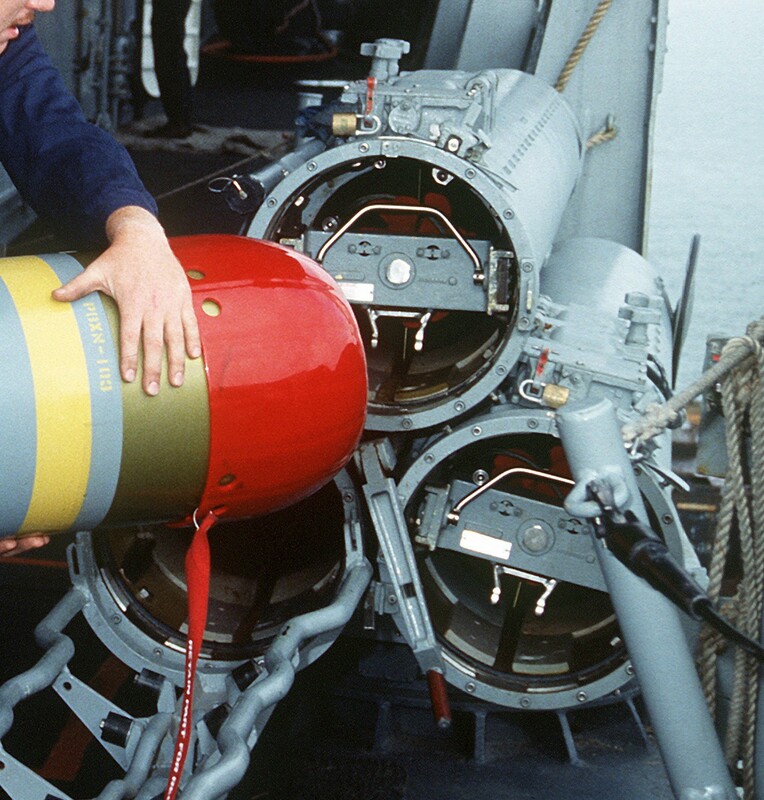 Remote control safe/ready features are incorporated. 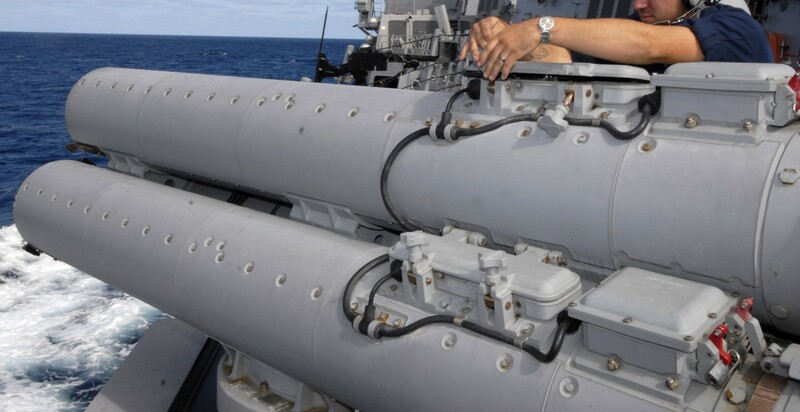 An off-mount Interface Junction Box (IFJB) is installed to channel and distribute electrical signals to the port and starboard launchers. 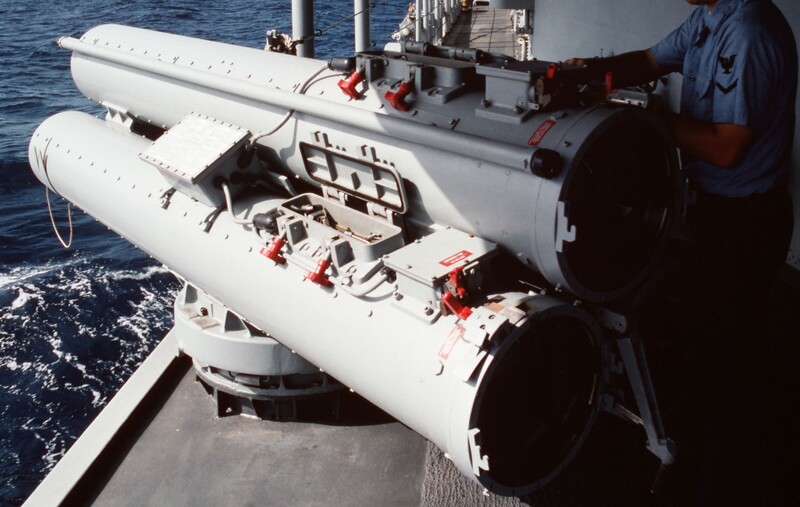 SVTT Mk 32 Mod.17 is a weatherdeck-installed launcher capable of launching Mk-46, Mk-50 and Mk-54. 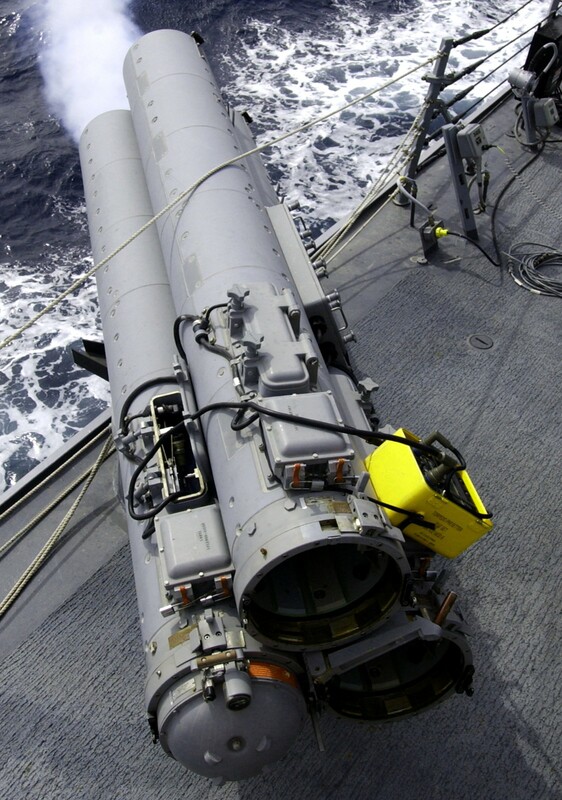 The Torpedoes are pneumatically launched and may fired locally (at the tube) or from a remote location. 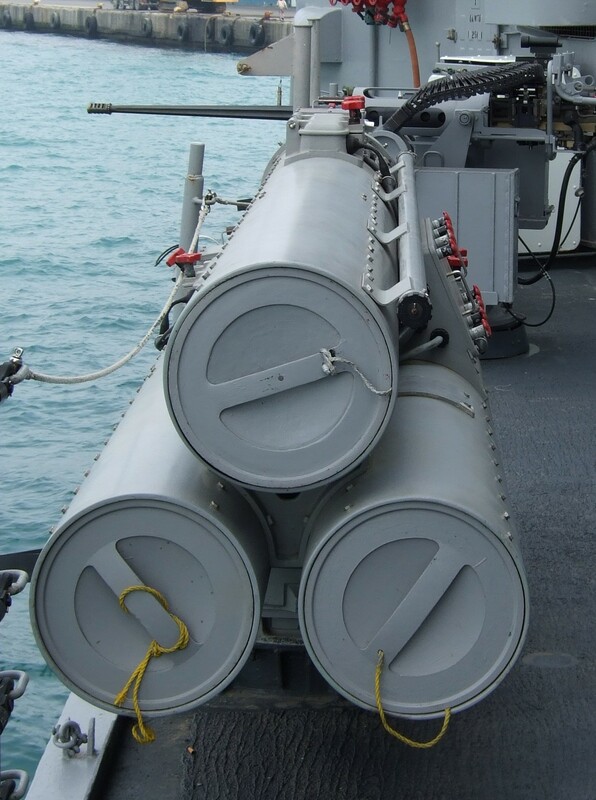 SVTT Mk 32 Mod.19 is a deckhouse-installed tube capable of launching Mk-46, Mk-50 and Mk-54 torpedoes. 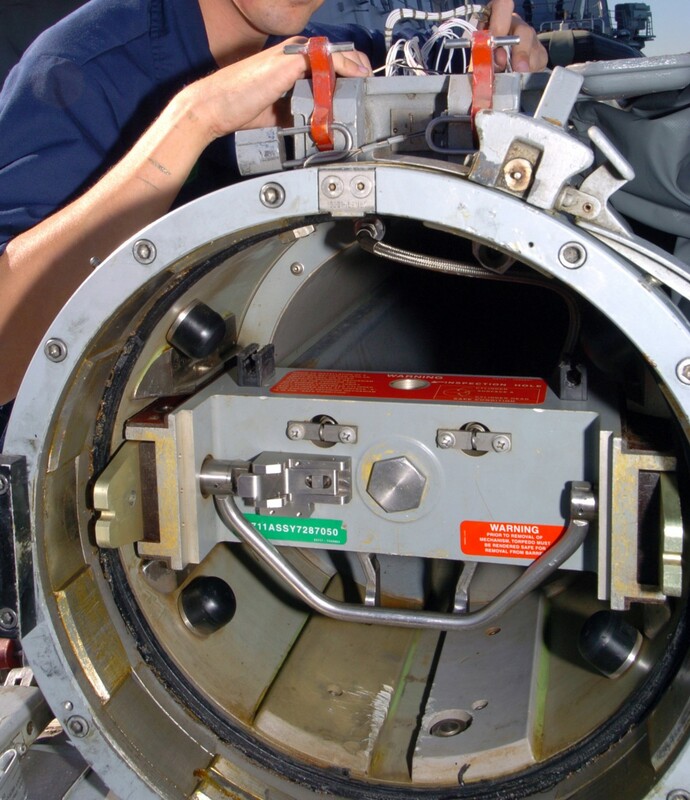 The Bulkhead Mounted Control Box (BMCB) and Operability Cable, although functionally related to the tube, are located off-mount.